2018 has been a great year for new discoveries for me personally, and today I’m taking a look at another one of those. The Norwegian post-rock band Spurv released their sophomore album last year, and as the giant post-rock fiend that I am, I of course had to check out what all the fuss was about. Admittedly, I think the scene has been growing slightly stale lately, with no real innovation to be found and as it turns out, “Myra” isn’t exactly a groundbreaking album by any means either. But don’t let that fool you — it’s still a damned good one. 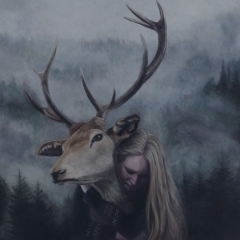 “Myra”’s album cover quickly caught my eye with its frosty beauty: a beautiful blond girl embraces a deer in the cold Norwegian forests, surrounded by a thick fog blanket, which quite perfectly compliments the soundscapes “Myra” is all about. It’s melancholic and cold, but also grand and wild. As with most post-rock, everything here is instrumental, and as such, I think having some fitting imagery, both physically and sonically, not to mention a clear-cut mood, is all the more important when you don’t have lyrics to paint those pictures for you. And Spurv succeeds in doing exactly that, right out of the gate. “Et løfte i fall” sets the tone with ambience resembling the cold northern winds, before a lonely and dramatic trombone is heard in “Og ny skog bæres frem”, and the instrument is actually prevalent through the entire record to add some nice orchestral sounds to the mix. The trombone is joined by shimmering waves of reverb-filled guitars as one has come to expect from a post-rock album, but also some surprisingly heavy riffs. I like my post-rock on the riffy side, so this is a big plus in my book. But the drums have to be an immediate focus point; there is this weird, disjointed, almost stumbling beat going on throughout the track that is really inventive I’d say, and there is generally some fantastic percussion to be found across “Myra”. Indeed, if you’re a fan of the drumming found on a Russian Circles record, you’ll definitely enjoy this — hats off to drummer Simon Ljung. “Fra dypet under stenen” is the first long, cinematic track of the album, and a beautiful one at that, where especially the fantastic lead guitar riff around the halfway point has me in awe, backed by an absolutely stellar production all around, with a lot of focus on the bass and drums section as well. This riff later develops into a wall of sound, which just keeps on rising and rising until you can almost feel how the track is on the verge of collapse, before getting its release and coming full circle by going back to the riff heard in the intro. It’s really clever songwriting, and exemplary of what is found throughout most of the album, which keeps it engaging for most of its 46-minute runtime. Unfortunately, I am not that fond of long-winded ambient tracks, though I see their purpose when done right. But “Hviler bekkenes sang” just goes on a bit too long without enough happening in it to satisfy my taste. Luckily, however, one of the strongest cuts on the album follows in “Et blekt lys lyder”, as the intensity is turned all the way down in a melancholic, beautiful soundscape very reminiscent of Mono’s “Hymn to the Immortal Wind” in sound, including some haunting string sections and glockenspiel. “Den gamles stemme brister” is another long post-rock slow-jam, where the drums take a step back from hammering out one cool beat after the other to let the atmospheres from the guitars and bass do the talking, backed by a soprano choir to really make the hairs on your neck stand up. Still, the best is saved for last, because “Myra” ends on a ridiculously high note. The chillingly titled “Allting får sin ende, også natten” is almost as close as you can get to absolute post-rock perfection in my humble opinion. The foreboding sample of German philosopher Martin Heidegger contemplating about the mortality of man sets the stage in front of a sole twinkling piano, seemingly without following a clear beat at first, before the song starts building up to this mind-blowing explosion of noise, like being struck by an instant snowstorm. Everything is just grandiose, from the wailings of the tremolo picked guitars and the ear worm of the returning heartbreaking lead theme, to the heavy, groovy guitars and bombastic drums in the bridges. The final build-up and crescendo is where things get truly, utterly fantastic though, as the drama and melancholy reaches boiling point before once again blowing me away with its overwhelming tsunami of guitars, trombone and strings. This is how you write an effective crescendo — it doesn’t get much better than this. “Allting får sin ende, også natten” is simply one of the strongest emotional experiences I’ve had with a post-rock track in a long time (I can’t remember anything hitting me this hard since the first time I heard pg.lost’s “Weaver” some years ago), and quite frankly one of the best I’ve ever heard in the genre, while also being one of my clear-cut favourite tracks of 2018 in any genre. As I stated at the beginning, “Myra” might not be the most forward-thinking post-rock album I’ve heard, but it most certainly is one of the best ones released in 2018. It is effective, massive, emotional and just really, really well written. There are a few ambient cuts that don’t do much for me here, but “Myra” is nevertheless very consistent in tone, delivery and emotional punch. As such, I can only recommend any post-rock fan to check this out, as it will surely satisfy them. And please, if nothing else, just go listen to that masterpiece that is “Allting får sin ende, også natten”.